As we look back and remember the lives lost, I highly recommend you take a little bit of time to read the following article by Tom Gregory, on emotions and the embodied experience of war. It’s a thoughtful reflection on the use of body counts and their political effects: ‘When dealing only with numbers, we tend to lose sight of the bodies that are left broken by the machinery of war, along with the individuals who are busy living and dying on the battlefield’. ‘Much ugliness is churned up in the wake of mighty, moving forces, and this is the backwash of war. Many little lives foam up in this backwash, loosened by the sweeping current, and detached from their environment. One catches a glimpse of them – often weak, hideous or repellent. There can be no war without this backwash’. You may also wish to read the following (old) piece, on the need to remember those – often shell-shocked and under-aged – who were shot for desertion. For more information on Combat Stress, click here. This morning Douglass Carswell became the first UKIP MP, winning 21,113 votes (59.66%) in the Clacton by-election. Whilst I’ve spent all morning banging my head on my desk and shouting angrily at the sky in a state of incredulity, others have been providing interesting analysis of what’s going on in British politics. Obviously the questions are worded a bit differently, and it turns out the answer isn’t, like I thought at first, ‘because people are idiots’. It’s way more complex than that. Taking to Twitter they’ve outlined 5 key trends that explain the rise of UKIP. 1) The working class are dissatisfied with the traditional parties. 2) People who leave school at or before 16 and people over 65 are shifting to UKIP. 3) David Cameron is pretty unpopular. 4) Pretty much everyone feels abandoned by the government. 5) People are eurosceptic, anti-migration, and pessimistic. Those watching the news over the weekend have probably noticed growing reporting on the protests in Hong Kong, under the name of ‘Occupy Central’. Discontent has been brewing for a while, in anticipation of changes to the Hong Kong electoral system. Hong Kong was officially handed over from British rule to China in 1997, and a big part of the handover agreement included the idea that Hong Kong would be ruled under the ‘One Country, Two Systems’ model. Consequently, Hong Kong has it’s own Basic Law, a form of constitution based on the system it inherited from British rule, which guarantees freedom of speech and assembly until 2047. On an everyday level, this means that today, Western social media sites like Facebook and Twitter, which are banned in mainland China, are still accessible in Hong Kong. In 2007, China promised that Hong Kong would attain universal suffrage by 2017. Hong Kong is ruled by a Chief Executive, currently Leung Chun-ying, and China promised that the post of Chief Executive would be elected – one person, one vote – by 2017, and it is this promise that is the focus of the current protests. Currently, the Chief Executive is elected by a committee, and the plan is for the committee to remain, but that it will nominate candidates which are then up for election by universal suffrage. This is where the problem arrives: on August 31st, Chinese authorities announced that candidates would need the support of more than half of the ‘broadly representative’ nominating committee to appear on the ballot: and the committee contains a high number of Beijing loyalists. Consequently, only candidates which Beijing approve of would have a chance to get nominated. This is what the protesters of ‘Occupy Central’ are unhappy about. So who are Occupy Central? The movement was initiated by an associate law professor at the University of Hong Kong called Benny Tai Yiu-ting, in early 2013, when he proposed an act of civil disobedience in the Central, the finance district of Hong Kong. The movement has included large consultations with citizens about Hong Kong’s democratic development, and has been slowly gathering support throughout 2014. It’s important to recognise that not everyone is unhappy about the Chinese decision, nor does everyone support Occupy Central: some polls have suggested that only around 50% believe Hong Kong should reject Beijing’s proposals. It’s an eclectic movement made up of academics, students and a number of other groups, the full name of which is ‘Occupy Central with Love and Peace’. Occupy Central have been warning Beijing that protests would ensue if it’s election proposals did not meet the standards they expect, and so after the decision on August 31st protests have been gathering support, with huge numbers turning out over the weekend and into today. China has made it clear that Hong Kong is still ultimately under Chinese rule, despite the ‘One Country, Two Systems’ model, and have so far signalled that they have no intention of budging on their decision. Earlier in the weekend, the army responded to the protests with tear gas, but yesterday and today protests have continued, calling for the resignation of the Chief Executive for pandering to China. Today (Wednesday) more people are expected to join: many are off work as 1 October is a national holiday, celebrating the foundation of the People’s Republic of China. Tensions are set to rise as protesters use the day to bolster support. Some suggest that Beijing is losing the hearts and minds of Hong Kong. News reports of the events in Hong Kong have been blocked in mainland China, and Instagram, which was used to share photos of the protests, has also been blocked in the mainland. It is very difficult to tell how this is going to end: some have drawn parallels with the Tiananmen protests in 1989. However, the spread of information, particularly via social media – even within mainland China – makes a cover-up of any military response impossible. Xi Jinping, the Chinese President, has been amassing and centralising power since taking over, and has even modelled himself on Deng Xiaoping, who was behind China’s opening up to the West. However, Deng was also in charge in 1989. The protests taking over 1 October celebrations is likely to be particularly testing. At this point, no one knows how China will deal with the situation, but those with any influence should be emphasising restraint. A military response would lose China any international and domestic support, but the lack of military intervention since Sunday is a good sign: let’s hope the protests open the space for conversation about Hong Kong’s electoral system, instead of bloodshed. Nowhere was the relief over Scotland’s decision last week to remain part of the United Kingdom more acutely felt than with those responsible for Britain’s nuclear deterrent system, Trident. The Scottish National Party had promised that independence would lead to the removal of Trident submarines and the associated nuclear warhead storage facilities from their bases on the Clyde estuary, not far from Glasgow. Irrespective of various Ministry of Defence contingency plans, it would have been very difficult if not impossible to relocate them. Consequently, a vote for Scottish independence could also have been a vote for UK unilateral nuclear disarmament. HMS ambush returning to HMNB Clyde, Scotland. Photo by UK Ministry of Defence. The UK is presently in the process of replacing the Trident system. 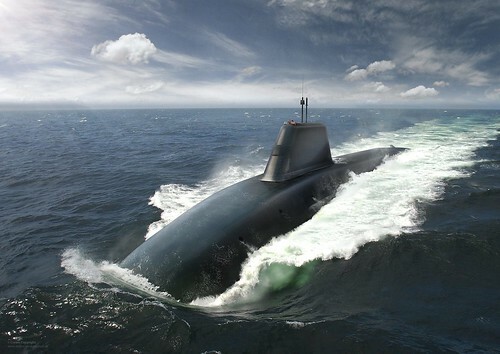 While last year’s Trident Alternatives Review, conducted at the behest of the Liberal Democrats, pointed to other reduced nuclear options, a replacement will almost certainly involve like-for-like replacement of the current four-boat submarine force. 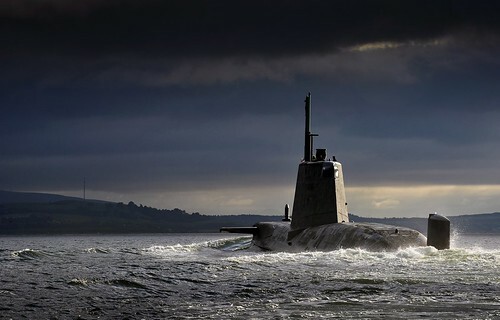 As a result, should the successor to Trident programme be given the “green light” after next years’ general election (which seems probable), the first of a new generation of nuclear-armed submarines will be deployed by around 2030 – and Britain will retain a highly sophisticated nuclear weapons capability with global reach well into the second half of the 21st century. Put bluntly, that means the UK will always have a submarine somewhere at sea and ready to fire its long-range nuclear armed missiles at short notice. Since work on the new submarines will not start until 2016 at the earliest, a Yes vote might have sunk these plans before they had even begun. It would also have forced the UK government to look long and hard at the nuclear issue, and would have propelled the question right into the heart of public debate. Instead, at a crucial moment, the No vote has papered over the cracks that are starting to appear in the nuclear rationale. The Scottish result is therefore an important victory for those committed to making sure the UK has an independent nuclear deterrent for decades to come – and a missed opportunity for those opposed to it. The argument that nuclear weapons are an insurance against an uncertain future remains seductive, but it’s undeniably less persuasive than it was during the Cold War. Even with eight states (nine including Israel) still nuclear-armed and the global non-proliferation effort fraying, the logic of existential deterrence that birthed Trident in the first place has unquestionably weakened: the biggest dangers the UK is now facing appears to be asymmetric threats from cross-border groups such as Islamic State, not an ideological bloc of belligerent nuclear-armed states. And because the need for the deterrent is no longer a given, a relocation from Scotland would have forced planners and officials to make the case for spending a colossal sum of money on it; far less will be required for mere replacement. But even more importantly, the UK government would have had to give considerable thought to what the country’s future deterrence requirements actually are. That would mean answering difficult questions about who, exactly, needs to be deterred – and whether nuclear weapons still in fact serve this function as they have in the past. A computer graphic image of a Successor class submarine. Image by UK Ministry of Defence. International pressure against nuclear weapons has grown considerably in recent years, particularly since Barack Obama’s Prague Speech in 2009 and his ensuing receipt of the Nobel Peace Prize. All this has greatly strengthened the notion of an international taboo against the use of nuclear weapons. And given the rapid development of hi-tech modern military systems and capabilities (such as drones, precision-guided weapons and cyber weapons) that may one day finally end the centrality of nuclear forces, the long-term rationale for, and utility of, the UK nuclear deterrent are both becoming increasingly blurred. These dynamics will be particularly acute for Britain, given its small nuclear stockpile and strong domestic anti-nuclear history. But while there will certainly be much debate surrounding the final “main gate” decision now scheduled for 2016, it will never be as heated and critical as the furore that would have been generated by the relocation of the entire UK nuclear weapons complex. That in turn makes it all the more likely the decision will be waved through in two year’s time. As a result, we may well come to look back on the Scottish independence referendum as the moment when the UK missed a chance to have an open and productive debate about its relationship with nuclear weapons – and instead it has all but guaranteed itself a nuclear-armed 21st century. Andrew Futter receives funding from the UK Economic and Social Research Council. On 11 September 2014 my colleagues and I published our fourth report, on the subject of ‘Intelligence and security oversight in an independent Scotland’, as part of our research seminar series ‘Security in Scotland, with or without constitutional change’. These are my personal thoughts on its implications. Is China reclassifying energy as a military security issue? Last week, news broke that China is sending troops to South Sudan to protect its oil interests in the troubled region. The troops will join the UN’s peacekeeping force in the area later this year. The original Wall Street Journal article notes that ‘while Beijing’s troops will operate under UN command, their posting to South Sudan marks a sharp escalation of China’s efforts to ensure the safety of its workers and assets in Africa and guarantee a steady flow of energy for domestic consumption’. It also marks China’s first commitment to send a battalion to a UN peacekeeping force, though they have contributed smaller numbers of peacekeepers to other missions. The UN mission in South Sudan is backed by a Security Council mandate which permits peacekeepers to protect civilians in South Sudan’s now nine-month long civil war, which has seen thousands of casualties and over a million people displaced. It has also shut down a third of the country’s oil production. The UN mission’s mandate allows it to use “all necessary means” to protect civilians in physical danger, including civilians at oil installations. Rebels have been kidnapping Chinese oil workers during the unrest and some have already been evacuated. Reuters published a response from Joe Contreras, UN spokesperson for the mission in South Sudan, who confirmed that under the mandate peacekeepers will be protecting ‘civilian oil industry workers’ but not oil industry installations, including ‘the refinery or pipeline or storage tanks’. Reuters also note China’s unusually active diplomatic role in the conflict: ‘Chinese officials have been in regular contact with Western diplomats to help African mediators push for a halt to fighting in the country. China has also pushed rival factions loyal to President Salva Kiir and rebel leader Riek Machar to talk’. China National Petroleum Corporation (CNPC), one of China’s ‘big three’ state-owned energy companies, has big investments in South Sudan – both in oil fields and a 1000-mile long oil pipeline to the coast. Military interventions to protect foreign energy supplies are hardly new, and the role of energy in foreign policy is well-documented, as are concerns over China’s international energy policy. However, these troops mark a big change both in China’s behaviour internationally and its approach to energy security. China’s international energy policy or expansion has so far been limited largely to investments in actual energy deposits, such as oil fields, or infrastructure. While the current mission is only mandated to protect civilians and workers rather than oil fields or infrastructure, it marks China’s biggest international military secondment in recent years – and is hardly unrelated to the country’s significant economic interests in the area. China’s growing energy demand is well-established, and energy has consistently been considered an issue of national security in recent years. However, this marks China’s first (relatively) large military engagement in an area where it has significant energy interests. China has so far released very little information about the mission, but is stressing that the goal of the mission is strictly to fulfil the mandate of the Security Council, ultimately to maintain peace and security in the area. It’s difficult know how much impact this will have on Chinese policy in the longer term, but it is definitely one to watch – especially given China’s increasing international energy investments in volatile regions. It may indicate a further shift in Chinese perceptions of energy security, towards viewing energy as a military security issue. If it sets a precedent for Chinese intervention to defend its energy interests abroad we’re likely to see much more focus on this in the future. Climate change legislation: China has politics too. Great blogpost from Nottingham’s China Policy Institute. Security research and the dispositif: if everything matters, nothing does from Critical Security presents some interesting thoughts on why and how we choose our research topics and the implications of these choices. Eric Talmadge is the Pyongyang Bureau Chief for the Associated Press, and runs this fascinating instagram account with photos from North Korea. A study has found empirical support for the idea that the Harry Potter stories have shaped the political culture of a generation. The articles raises some interesting points about the impact and role of popular culture in politics. In the Harry Potter study, he found that ‘reading the books correlated with greater levels of acceptance for out-groups, higher political tolerance, less predisposition to authoritarianism, greater support for equality, and greater opposition to the use of violence and torture’. 10 ways you can write everyday – some great advice. Seven strategies to improve academic writing by Patrick Dunleavy. Earlier this week I discovered this (and this) comparison website: really useful if you’re working on an article and have a feeling you might have written something similar elsewhere. Word can do compare documents using the compare feature, but it focuses on differences rather than similarities – which pretty useless if you have two documents which are (hopefully) completely different and want to look for overlap or similarities. These websites allow you to copy two different texts into boxes and then compares them for you. IR/security research is often by its very nature international, and can involve empirical work in any number of different places and/or languages. When your research is done in one language and has to be written up in another one (in Western academia, usually English), translation is an essential part of the research and writing up process. However, when I began my PhD I found there was very little advice available on the issues surrounding translation, and most of what I learned before my fieldwork came from informal talks with colleagues and supervisors. So, I thought it might be useful to write a blog-post about some of the problems and pitfalls of translation during research, many of which I have first-hand experience with, followed by some ideas on how to solve them, or at least minimise their impact. As anyone who has carried out research involving translation will know, it is rarely straightforward or clear-cut. There are no clear rules for how to approach it, but while there is no ‘right way’ to do it, there are many bad ways to go about it. Some of the key issues to think about are listed below, but beware: these come largely from my own experience and what worked for me may not work for you. Likewise, you may disagree with some of the opinions I’ve formed based on my experience, which is fine (of course) – the main point of this is to get you thinking about the big issues, and to find your own solution to them. There often seems to be an endless list of problems with translating, but without some form of translation we would struggle to understand the world outside of our own little corner. When something is translated, another layer of interpretation is added to the original, and some meanings, nuances or details may be lost. Translation is never neutral: it necessarily involves inserting the translator into the data and transforming it. The translator is cannot be extracted from the translation process: s/he has a lot of power as a meaning-clarifier and maker. Personally, my research has a discursive focus, which has influenced both my thinking on and my approach to translation. Looking at ‘discourse’, particularly if you’re planning to use discourse analysis (either in a language other than your native one or in your native language which then has to be translated into another language during your writing-up) poses some further problems (more on this later). Below I cover some common issues countered during translation, divided into ‘practical’ and ‘linguistic/cultural’ problems, and then suggest some strategies to avoid these. The title of this blog post may or may not have been a cheap ploy to justify illustrating it with a picture of Scarlett Johansson. Firstly and most important of all: are your language skills good enough? Here you need to bear in mind that the skill set needed depends very much on the type of research you’re doing. Do you need to do interviews? Archival/documentary research? The type of data you’re using will affect the skills that you need, and will help you target your language learning: think about whether speaking/listening may be the most important for you, or whether perhaps reading comprehension is more important. Ethnographic research will of course require much more extensive language skills than other forms, but also has more literature providing guidance on this. This is slightly controversial, but I don’t think you have to be fluent, or a native speaker to research in another language. But you do have to be good enough for what you need to do, and that requires some reflexive thinking and self-awareness. If you’re not a native speaker, it’s important to be open and disclose your language skills (and limitations) in the research outputs. The time factor: if you’re not a native speaker, translations can take a lot of time. This is particularly true if your research involves processing a large number of documents. Things don’t always translate well – not everything has an equivalent in another language. Some texts, words or expressions will therefore not have a direct translation, and you need to have a strategy for dealing with these. On top of this, some terms or words can have multiple meanings in the original language, which can be either lost in translation or mistranslated. This was a big concern for me, doing research in Chinese – and one of the many reasons I decided to conduct my interviews in English. Many words have multiple meanings (particularly in Mandarin), and your interviewee may be purposefully vague. If so, your translation may put words in her or his mouth that s/he would not have said, by giving their words a more specific meaning in the translation. It’s worth noting that this is a problem for native speakers too (in cases where they have to translate during the writing-up process). Knowing a language, even to a fluent or native standard, does not automatically mean that it will be easy to carry out research interviews in that language. In practice, ‘research language’ is very different to usual language skills. Official discourse is often very different to everyday talk and in many cases uses a different vocabulary, which can make it tricky even if you’re a native speaker used to ‘everyday talk’. Lastly, cultural knowledge is an important part of understanding a language. When something is translated, it is taken out of its discursive and cultural context, and in the process it can lose some of the meaning, or things can appear significant when they are not (and vice versa). A couple of examples: this article is by a Russian speaker who researches North Korea, and explains how some things translate much better from North Korean into Russian than they translate into English, because North Korea and Russia have a shared communist history and many North Korean expressions are borrowed from Soviet Russian. Translated into English, this context is lost. During my own research on energy security in China, I found a lot of discourse around China’s ‘scientific’ outlook and approach to energy security. It was only during a conversation with a fellow (non-Chinese) China-researcher that I began to view this more as a Marxist trope common in Chinese official discourse than something with more significance to China’s approach to energy security specifically. It’s easy to overlook or miss things, but it’s worth remembering that it can be just as easy for native speakers (who sometimes get home blindness). It does mean it’s important to be extra careful, however. Until the day this magic button appears.. While this strategy may sound counterintuitive, in many instances translation can be avoided. For example, if you’re studying official discourse, it’s often possible to access official translations of key documents in English. Using this strategy, you need to be aware that the texts are prepared with a foreign audience in mind (which has important implications). Personally, I decided to avoid translating where possible. I conducted my interviews in English, which limited number of interviewees (not ideal, but I decided it would be better than the risk of misrepresenting my interviewees). In my case, this was less of a problem as my research relied primarily on documentary material. Many of my key documents were available in official translations, though I had to translate others. By translating documents where no official translation was available I also avoided limiting analysis to documents ‘pre-approved’ (and, therefore selected for translation) by the Chinese government. In the case of some particularly important documents I also checked official translations against their original (Chinese language) versions. This was important as official translations can at times exclude particular (often potentially controversial) sentences or sections of documents when produced for a foreign audience. If you don’t speak the language you are translating from to a native standard, get your translations checked over by a native speaker. If possible, do this anyway as a second pair of (bi or multilingual) eyes can only help. Using a translator or interpreter can save a lot of time and hassle, but can also be problematic (and expensive!). There’s no such thing as a perfect translation between two different languages: your translator/interpreter is using their own knowledge and skills to filter, manage and transform the information given by your interviewee/document into a language that you understand. This can add extra layers of meaning to your data, so the usefulness depends very much on the focus of your work. It can be particularly problematic if you’re using discourse analysis, as you’re no longer analysing the discourse of your original source but translated version. If you do decide to use a translator or interpreter, make sure that you are clear with them about exactly what you need them to do – if you need as close to a perfect translation as possible, make sure that they know this. If you’re conducting an interview, go through the questions and your interview strategy with your interpreter beforehand – the wording of your questions may not actually make sense if they are translated literally. When processing a lot of information, online translation engines like Google Translate can be helpful to filter your material. While they are largely useless when it comes to actually translating articles and documents, they can help you identify what’s actually worth translating or spending more time on. If you have a lot of material, this can be a helpful strategy to narrow down your focus. Lastly, it’s important to remember that there’s no such thing as a perfect translation. Translation is not a science, and your skills will get better with experience. Ps. If anyone can recommend any useful resources about using translations and translating during research, please either add it in the comments section below or email me, and I’ll add them at the end of this post! The 2014 NATO Summit presents an opportunity for world leaders to sit around and solve bicker about security issues ranging ‘from fragile states to piracy, from terrorism to cyber attacks‘. This year you don’t have to be any where near Newport to enjoy the friendly ‘banter’ and juvenile japes of the NATO summit, as many participants have taken to social media in order to communicate to audiences diss each other publicly. If you forget about the 2600 deaths and 6000 serious injuries in the ongoing Ukrainian conflict it’s almost quite funny. #AnnexationLOLS. To be fair, it’s kind of refreshing to see some state social media usage that isn’t dull, predictable and boring. But let’s just hope that all the delegations to the NATO summit are putting in as much thought and effort in to actually dealing with the serious issues at hand, as they are to bickering on social media. Hot off the press: Critical Security Methods, by Claudia Aradau, Jef Huysmans, Andrew Neal and Nadine Voelkner. I’ve just ordered my own copy, and can’t wait to read it – it’s always nice to see research methods taken seriously. In the aftermath of the shooting of Michael Brown in Ferguson, Missouri, here is an interesting article on how it would have been covered had it occurred in a country other than the US. Includes: ‘Chinese and Russian officials are warning of a potential humanitarian crisis in the restive American province of Missouri, where ancient communal tensions have boiled over into full-blown violence. “We must use all means at our disposal to end the violence and restore calm to the region,” Russian Foreign Minister Sergei Lavrov said in comments to an emergency United Nations Security Council session on the America crisis’. The ethics of killer robots. Yes, you read that correctly. Fascinating piece on translation and the relationship between the North Korean dialect and Soviet Russian. Apparently North Korean has a lot of borrowed phrases from Soviet Russian which are difficult to translate into English, but make sense when translated into Russian. Professors’ pet peeves. Includes beauties like: don’t be too cool for school, don’t fudge your formatting to make your essay look longer (I’m not an idiot), and don’t ask the professor if you missed anything important during your absence (‘Of course you missed something important! We’re college professors! Thinking everything we do is important is an occupational hazard. Here’s an alternative way to phrase it: “I’m so sorry I missed class. I’m sure it was awesome.”‘). Seriously considering printing this list out as a handout for start of term. Confuse students to help them learn? Great piece on Dawn of the Planet of the Apes as the ultimate IR blockbuster, and some interesting ideas for using it in teaching. Ten grammar rules it’s ok to break (sometimes): including recognition that ‘Many prescriptive rules originated for screwball reasons, impede clear and graceful prose, and have been flouted by the best writers for centuries’. In praise of idleness, by Bertrand Russell: as relevant now as 1932. For anyone involved in or thinking about media activities, this reflective piece from RelationsInternational is definitely worth a read: Mum, did you see me on TV? Next time you’re chairing an intense debate, workshop or seminar, consider using these philosophy referee hand signals to manage the situation… Personal favourite: Your argument is circular! Finishing the PhD thesis: some advice for those aiming to submit in October from the Guardian. When good supervisors go bad, from the thesis whisperer. Some great advice about managing supervisor relationships: while I’m speaking as someone who happened to be lucky on the supervisor front I’ve heard enough bad stories for this to be a useful read! How to let go of perfectionism and become a productive and motivated student/sane human being – useful for post-PhDs too.